It is feeling a little strange to be back in the blogging roll after the flip house project. We are finishing up some small things this week at the flip house to make sure it is perfect when the new owners move in on Monday. Monday!! We close on it on Monday!!! It is so exciting. We still can’t believe it. I want to thank each and every one of you who followed our biggest project yet. Your kind and encouraging words were a driving force throughout every hour we spent there. Today, I am going back to the roots of this blog. 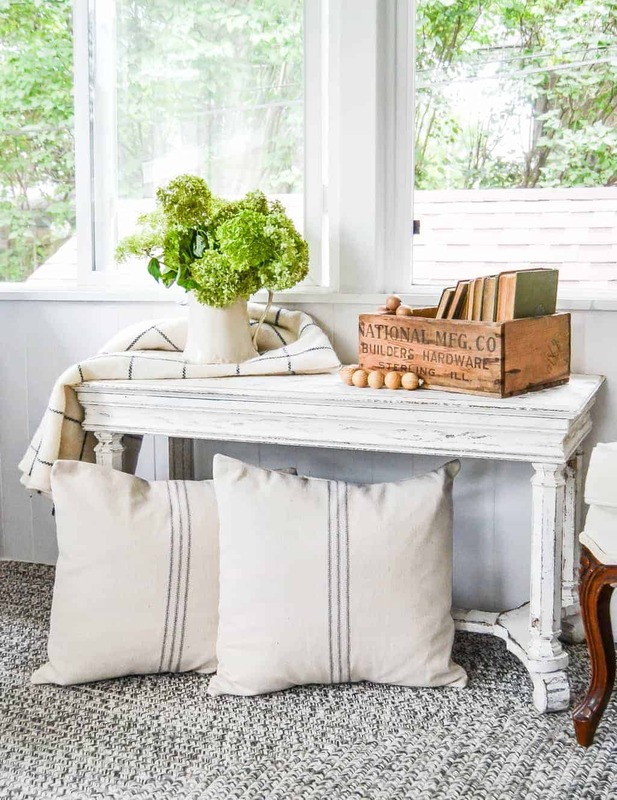 This Piano Bench Turned Farmhouse Bench project illustrates why I started this blog. My motto has always been that you can decorate your home in any style you want by shopping yard sales and thrift stores. You will save so much money and have the home of your dreams. 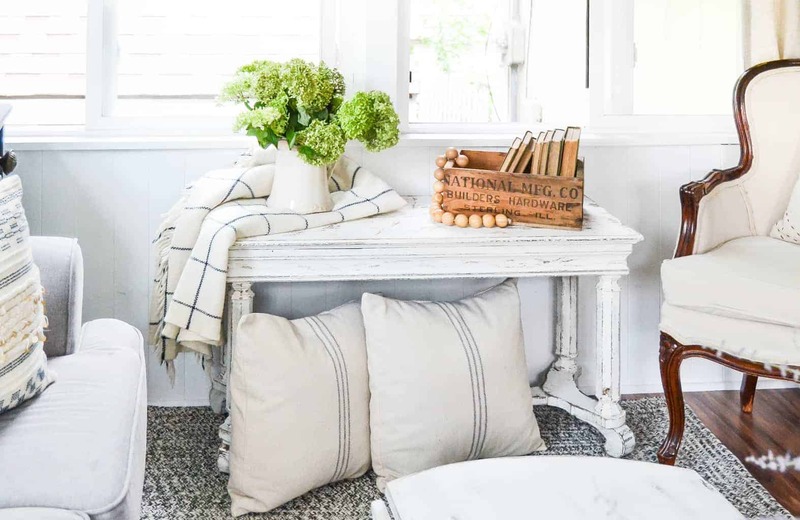 If you don’t believe me, sign up for my weekly newsletters and you will receive my Guide To Decorating A Beautiful Home On A Yard Sale Budget. All my tips and tricks are in there. On to the farmhouse bench project! I get asked all the time how I choose pieces to make over. I thought I would try to explain each piece I share here and why I picked it up. That may help you when you are out hunting and deciding if you should pick up a piece or not. It is a bench! Benches can be used for so many things; seating, tables, end of beds, etc. It has storage. It’s a piano bench so the seat lifts up and there is storage inside. 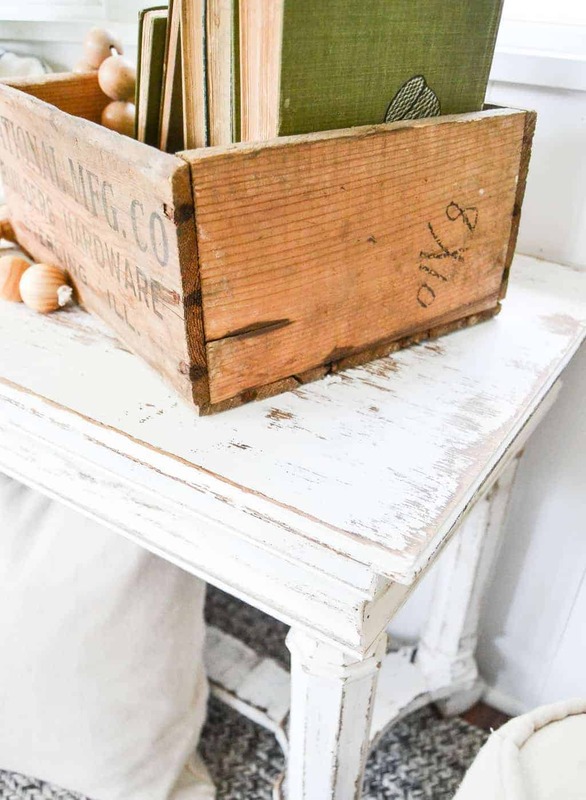 Pieces with storage are always high on my list. The tone of the wood. The wood was dark and didn’t have any sheen to it. I knew once I painted it and distressed it, the dark wood would be beautiful peeking out in different spots. 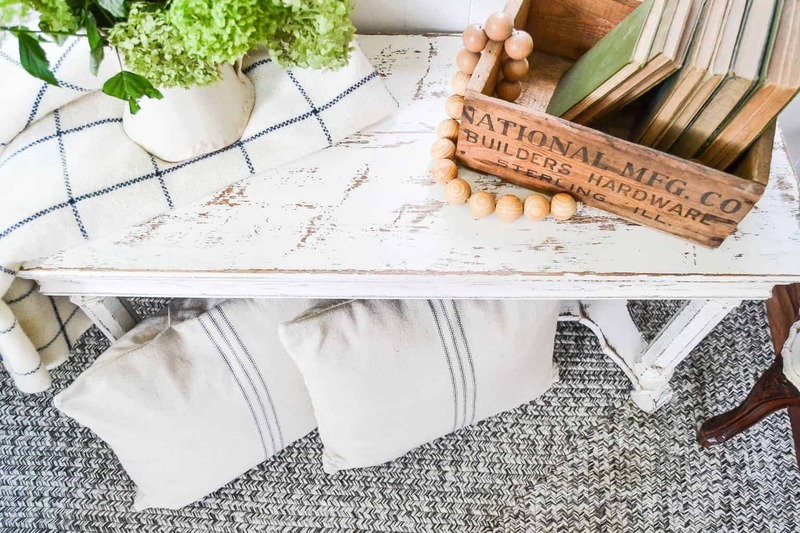 The size of this bench is great for smaller spaces and larger spaces. A lot of times, I have to sell the pieces we do. If it doesn’t work in our home, I want to make sure it is feasible for other homes. 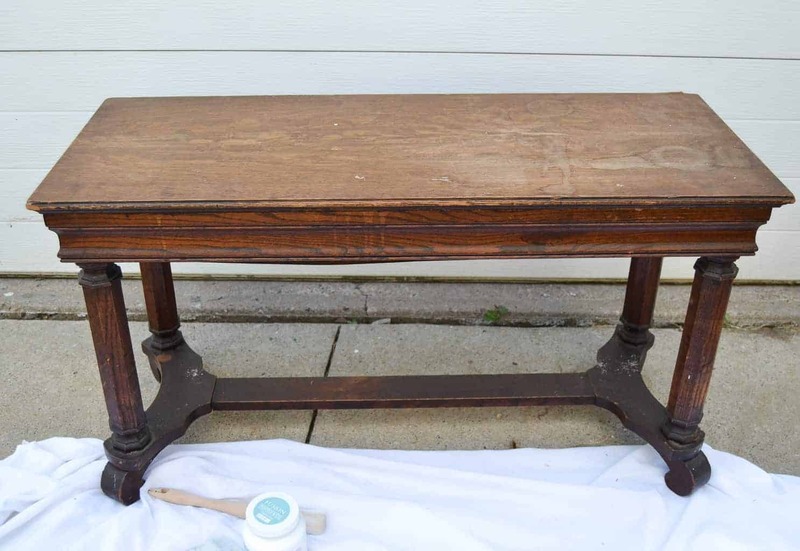 To turn this into a farmhouse bench for our home, I knew the makeover would not take long at all. After Mr. Creative added some nails to fix the bottom of the bench, I started painting. I put two coats of paint on the bench. Once it dried, I used 120 grit sandpaper to rough up the edges. That’s it! 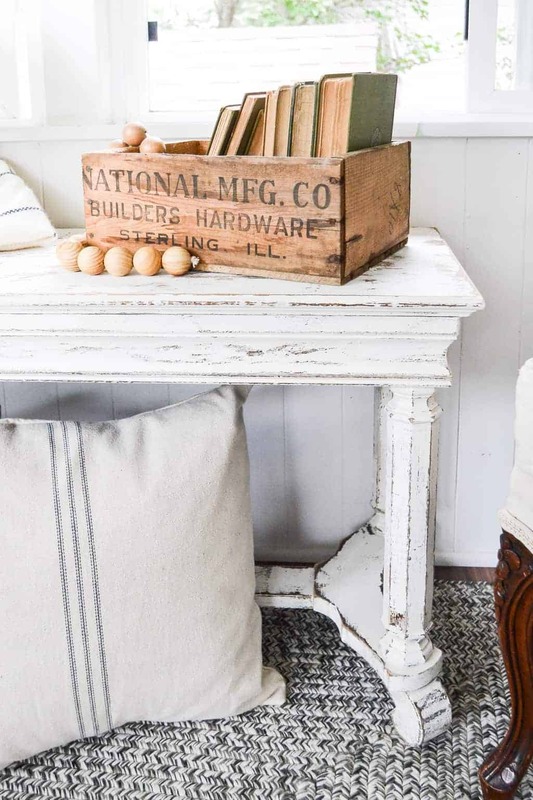 That is all it took to turn an old piano bench into a farmhouse bench for our home. Projects like these are the most rewarding for me because they are inexpensive and I get a custom piece, in the style I want for our home. It is a win-win all around! I have gone out to hunt for pieces during the flip house, but have just been storing them in our garage. Once we started bringing all the tools and things home from the flip house and rearranging our garage, it was like Christmas morning. I had forgotten a lot of the pieces I bought and uncovering them again made me want to work on them as soon as possible. This piano bench was in the front of the garage and since I knew it would not take long to transform it, it was the first piece I tackled. 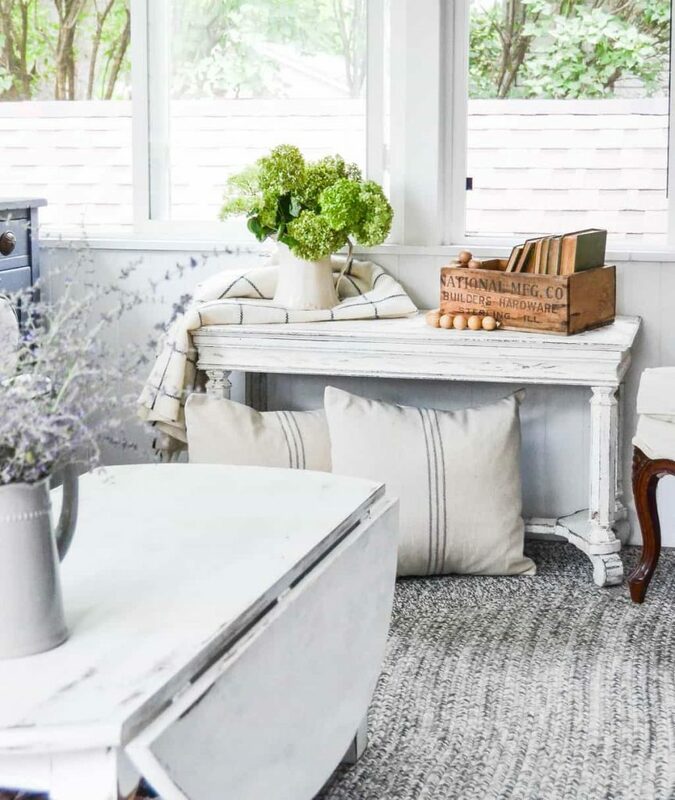 If you don’t come away with anything else from this post, I hope you feel inspired to find pieces that you can customize to your style and budget. Pieces that may not talk to you as they are, but can be exactly what you are looking for after a little work. 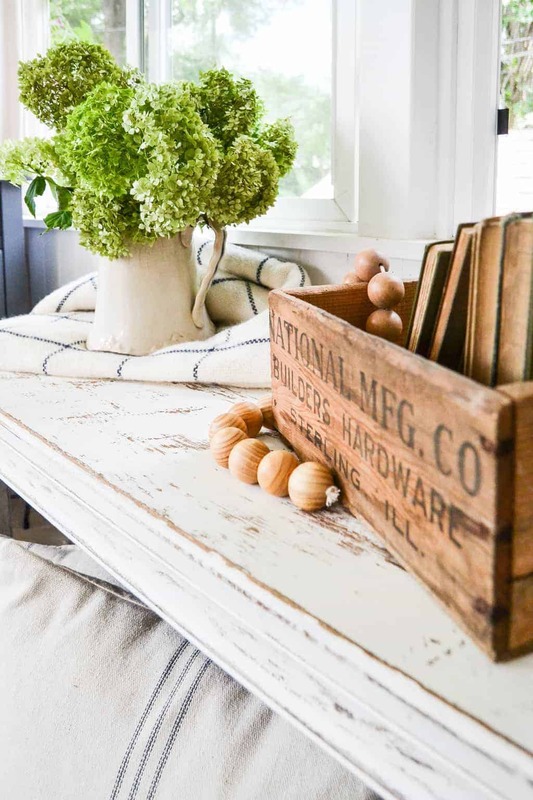 It is my goal with this blog and I love hearing from you when you tackle projects like this. Share your latest creations in the comments below!!! If you don’t have time to look for a bench, check out these great options I found for you! I love the piano bench. That is a super idea. I have been trying to find something for foot of the bed. Absolutely beautiful Lindsay! 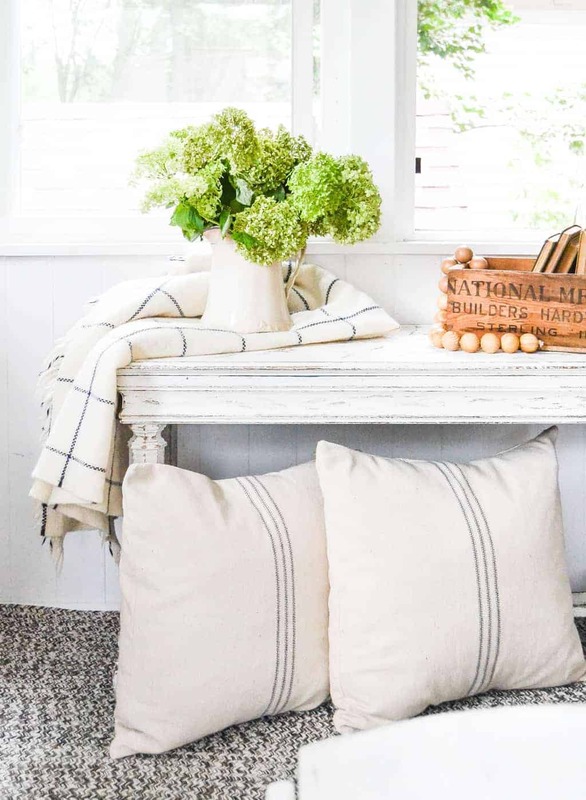 Love the results and your styling of the bench is gorgeous. Well wow! I just happen to have an organ bench that I was afraid to toss out with the broken organ! Now I know what to do with it. I’ll have to reupholster or make a slip cover for it because the fabric is green pleather, and the cats will end up snoozing on it, but I have the perfect fabric. Your welcome! Have fun with the project!